I’d like to welcome 2 wonderful new contributors to Outstanding Mini Albums! I’m so excited for them both to share some of their awesome creations with all of us! Hi, my name is Kim, but everyone calls me Kimi and I am a SAHS (Stay at home scrap booker). I am married and have three grown sons. All of which have left home. So I have heaps of time on my hands for crafting. I fell in love or became obsessed with Scrapbooking in 2005 when I wanted to give my husband something different and handmade for Christmas. I made him a mini album with photo’s from his childhood. That was it for me. I was totally hooked. I have since ventured off into various aspects paper crafting, but I am always drawn back to creating mini’s and not a month goes by that I don’t create at least one – be it big or small. I have been crafting most of my life. I learnt to crochet from my grandmother when I was 10 and have been doing it ever since. I also learnt to sew from my Mother and have dabbled in quilting; cloth dolls; embroidery and small patchwork items. I now use a lot of these skills in my paper crafting projects and I sew more paper than fabrics these days. One of my most favoured styles is shabby chic/vintage and I also love to dabble a little in grunge. 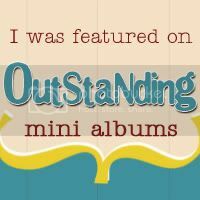 I am super excited to be a part of Outstanding Mini Albums. I can’t wait to share my my unique scrappiness and creativity with you and my fellow contributors here at Outstanding Mini Albums. Hi, I’m Kimmy Jaster. I live in the same tiny Arizona town I grew up in, 2 doors down from my childhood home. I’ve been scrapbooking since I was in junior high school (I won’t tell you how long ago THAT was!) I am currently on the design team for Punky Sprouts (a fabulous mini manufacturer) and True XoXo (a challenge blog). 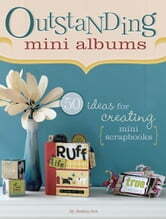 I love all sorts of paper crafting, but mini albums are my favorite medium. I’ve got 3 baskets full of completed ones, plus a whole bin of blank ones. Ten months out of the year I teach 4th grade. I like to spend my summers traveling. I don’t have any kids of my own, my students fill my heart. I have 3 beautiful dogs, that are spoiled rotten. Featured Mini Albums: Check these out! Anne [Kesi'art] on Featured Mini Albums: Check these out!